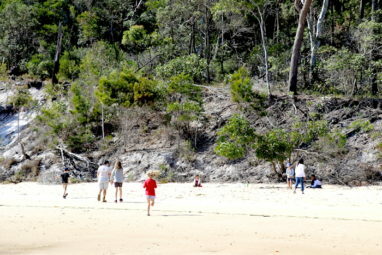 I had wanted to visit Fraser Island for nearly 15 years. We’d put it off due to being unsure about how to get there and how to get around when we did. We finally took the plunge and experienced a trip that I’m not sure we would be able to repeat anywhere else in the world. I don’t know why we waited so long to explore this incredible place. 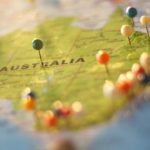 From visiting lakes as clear as crystal and flying over seas watching whales breach, to driving through sand dunes and ancient sub-tropical rainforest, and tasting native bush tucker delicacies. The island seemed to satisfy all the senses, and my inner child. 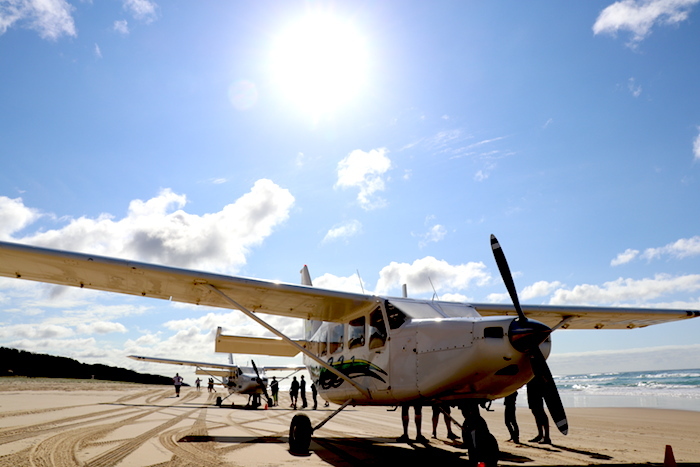 If you don’t know much about Fraser Island, native name K’gari, then the first thing you need to know is that it is considered the largest sand dune in the world, and has been listed as a World Heritage Site since 1992. It’s easy to see why from the minute you arrive. To get the most out of your trip, be ready to explore and try things you haven’t done before. If you do, you’ll be in for an unforgettable adventure. The Island is approximately 120 km in length and 24 km wide. 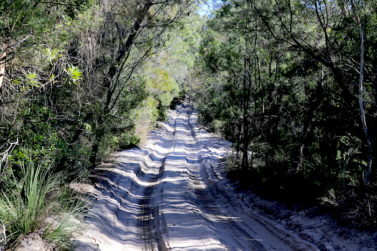 The only way to get around the island is by 4WD, but you don’t need one to enjoy it. 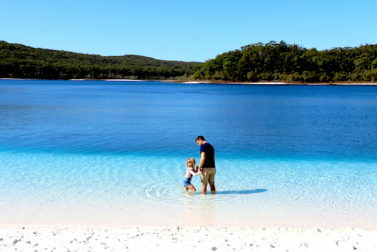 If you’ve heard of Fraser Island then you’ve probably heard of Lake McKenzie, and for good reason. The extraordinary colour of this lake will have you gasping as you walk down the path and catch your first glimpse. The bright aqua rim of the lake is lined with pure white silica sand. It’s a picture perfect paradise that will have your friends sighing with envy when they see your photos. 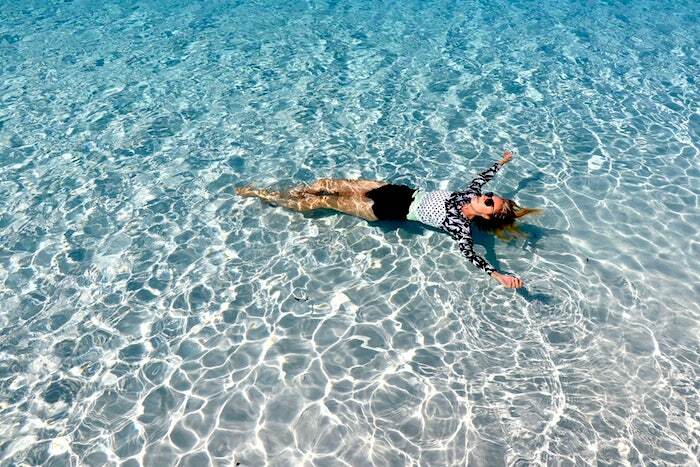 Try swimming in the water and then rubbing the sand all over your skin. You’ll be feeling super soft for the rest of the holiday. The colour of the water makes for a surreal swimming experience that we will be returning for. 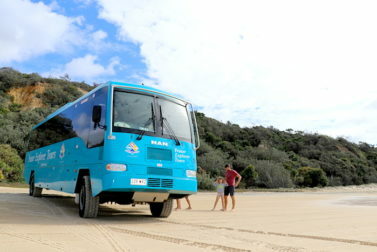 As you drive along this awe-inspiring stretch of beach, keep a lookout for whales, dolphins and dingoes. Pretty Eli Creek is the largest fresh water creek on the Eastern side of the island and makes for a fab picnic stop. 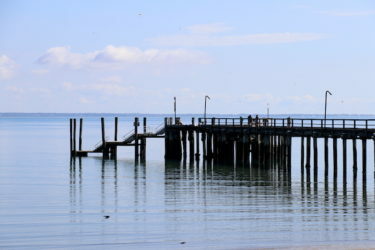 Take a walk up the creek or along the boardwalk and enjoy the fresh, clear water that pours into the ocean. The water here is so clear you almost can’t see it at times. 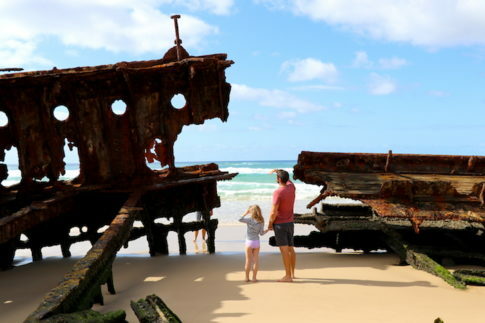 As you drive along 75 Mile Beach you’ll suddenly recognise the silhouette of this infamous Fraser shipwreck. Built in Scotland in 1905, the Meheno was a luxury passenger ship and also used as a hospital ship in the First World War. When the ship reached the end of its service it was taken to Osaka for dismantling. 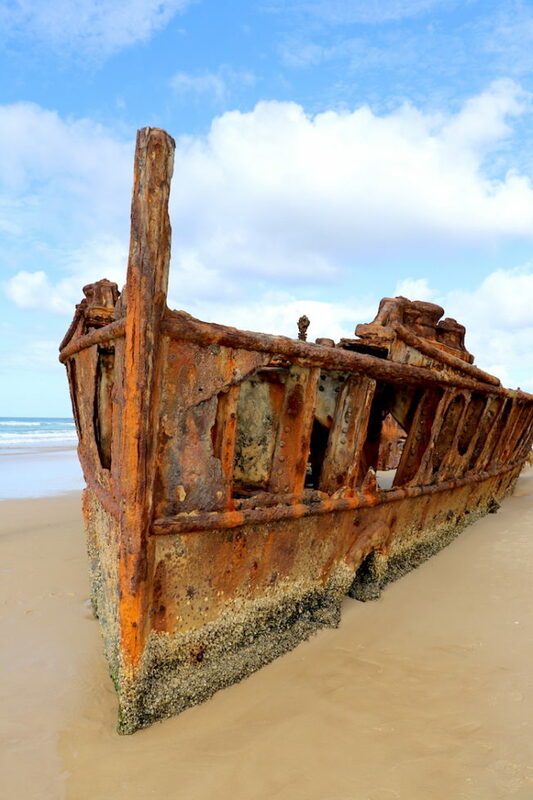 On the way it was caught in a huge cyclone off the coast of Queensland and was beached on Fraser in 1935. 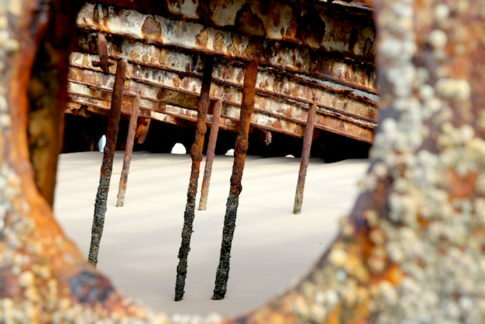 It’s fascinating to walk around the wreck and identify the different parts of the ship. If you’re into photography it will keep you fully occupied, particularly at sunrise. 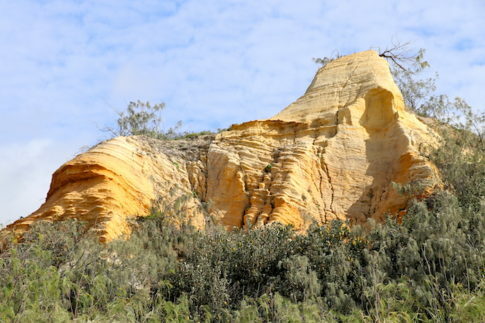 As you head beyond the wreck you’ll come across an area of unusual sand cliffs formed by mother nature herself, otherwise known as the Pinnacles – for a moment I wondered if I was in Egypt staring at unusual manmade carvings. I’m a beach and mountains kinda girl, but discovered a new found love for the rainforest on this trip. I’ve seen a fair few rainforests in my time, but something about this one blew me away. The enormity and grandness of the trees, many of which were like wise old grandfathers of the forest, quietly commanding the respect they so rightly deserve. Looking up at these giants was like something out of a fairytale. 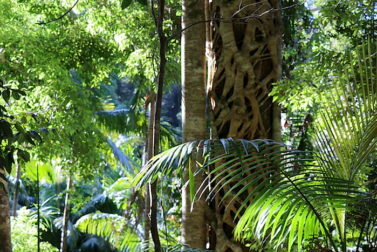 There is something magical about the rainforest on Fraser, and I was completely gob smacked. We stopped off at Central Station to see where the once loggers had set up camp. Logging was thankfully ceased on the island in 1991. This is a great stop to learn more about the history of the island and the diverse flora and wildlife that surrounds you. The Fraser Explorer Beauty Spots Tour is absolutely perfect for all ages, and if you get Martin as the driver you’re in for a day of full on belly laughter. He was genuinely hilarious. His knowledge was second to none (I hear the other drivers are also fantastic) and we felt that we learned so much from him. On our own we would have been none the wiser about some of the most interesting parts of Fraser’s history. Now that we’d got our bearings from the Beauty Spots Tour, and had sampled some of the top spots on Fraser, we were ready to head back to our favourite spot and spend some time together as a family. 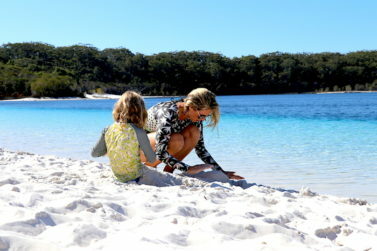 We hired a 4WD through Aussie Trax and commenced the ridiculously fun drive back to Lake McKenzie. I wasn’t sure what to expect as neither my husband or I were experienced off-roaders. Plus several people had suggested that we should ‘drive it like you’ve stolen it’ (so as not to get stuck). I was preparing myself for some marital driving bliss – not. But fear not, divorce was not on the cards. In fact it brought our family even closer together. We laughed from the moment we started the drive to the end of our bumpy adventure. The vehicle took us easily through the pits and troughs of the sand tracks. It was similar to driving in snow. We probably only passed six vehicles all day, and had to reverse just twice into passing bays. We stopped several times along the tracks to hear the sounds of silence serenaded by the impressive and diverse bird life (Fraser is a haven of bird life). When we got back to stunning Lake McKenzie, we spent time at the quieter end of the beach (a perk of going there on your own). We must have been there for a couple of hours just soaking it all in. I can’t recommend the 4WD driving experience enough. If you’re a confident driver then this is an absolute must! When you’re surrounded by rainforest and sand tracks it can be hard to get an idea as to the lay of the land and where you are situated in relation to everything. So, what could be better than taking to the sky to get a clear picture. We couldn’t believe that this experience cost only $80 each. Nervously (I’m not a fan of flying) we got into the tiny six-seated aircraft and popped on our headsets. Before we knew it we were in the air and watching whales put on the performance of a lifetime. With the turquoise water below, we could also see the clear outline of both manta rays and turtles playing in the waves. What an incredible view we had. 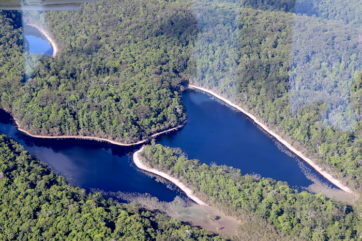 We then flew over the island to see the various sand formations and lakes, including one shaped beautifully like a butterfly. 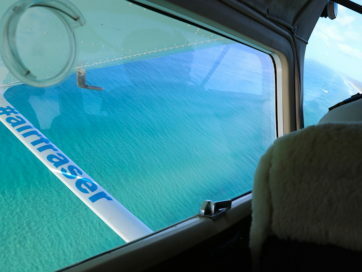 If you want to really appreciate the unique landscape of Fraser, then a flight is probably the most spectacular way to do so. There aren’t many accommodation options on the island. Some people opt for day trips and others take their own camping gear. 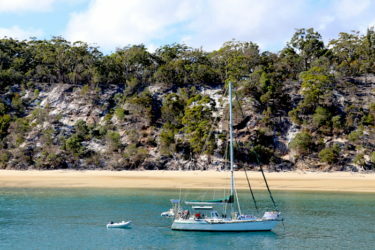 We wanted to stay on the island but have some home comforts, so we stayed at the Kingfisher Bay Resort which was the perfect base to explore the island and get involved in all things Fraser. 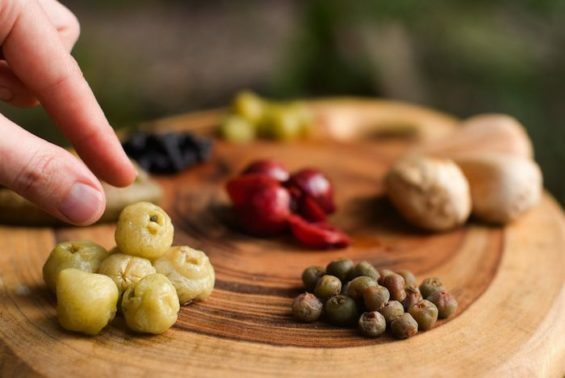 Whilst we were at the resort we indulged in a sophisticated Bush Tucker Talk and Taste; sampling crocodile, kangaroo and many of the unusual native berries, fruits and leaves from the island. If you’re a foodie or interested in indigenous and native culture then this will certainly feed the soul. 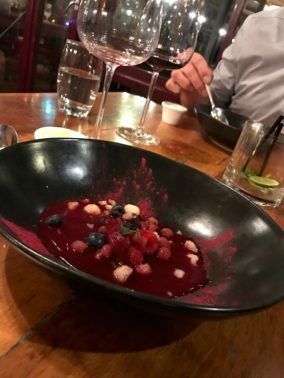 It’s also a great introduction into some of the ingredients and flavours you can enjoy on the degustation (taster) menu at the resort’s signature restaurant, Seabelle. 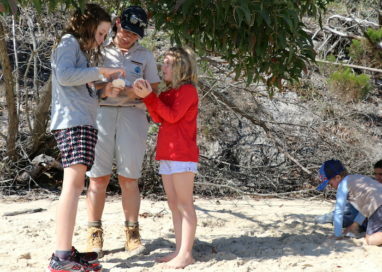 Since returning from the island our six-year-old daughter has not stopped talking about the Junior Eco Rangers holiday program. 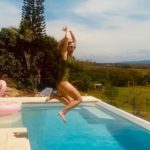 It completely transformed her experience on the island. 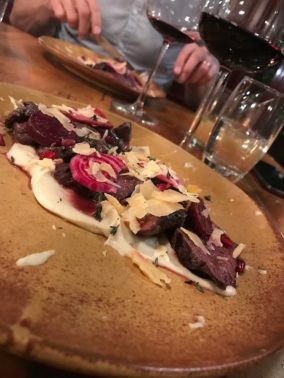 Running programs throughout the day and in the evenings gave us the rare opportunity to enjoy a date night or two. 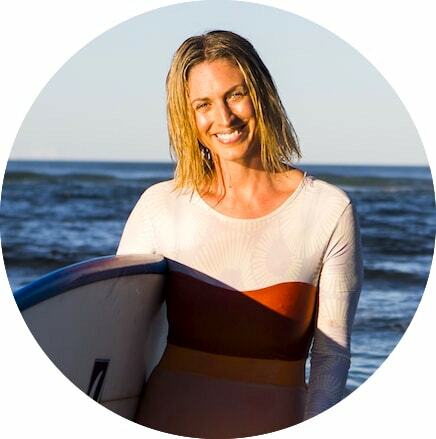 She went on night walks to spot marine life, toasted marshmallows over the campfire, and learned about the local environment through crafts, games and activities. It was a huge hit and she couldn’t get enough of it. There was an array of ranger-guided activities at the resort which kept our little family fully occupied and buzzing with excitement over what was coming next. 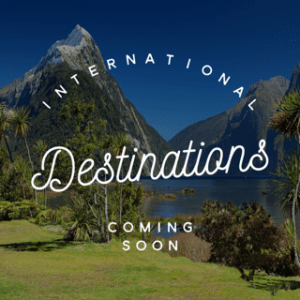 From canoeing and Segway tours to beach and mangrove walks. After all this activity we sat with a drink and took in the impressive sunset from the pier. We couldn’t write this blog without mentioning Dingoes. At the time of our visit they were in pup season – so were not out and about as usual. Don’t let Dingoes put you off, but please make sure you are ‘Dingo Safe’. 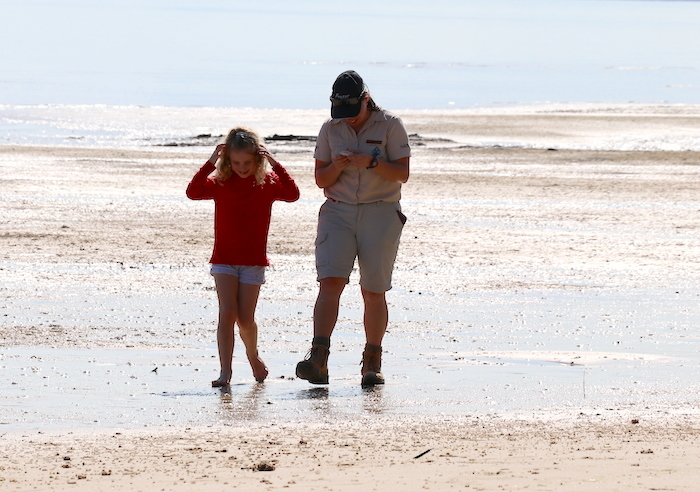 Listen to the advice from the Rangers and make sure you read and abide by the signs on the island. This is important for both your safety and the conservation of the Dingo population. Sitting off the South East coast of Queensland and just a few hours North of Brisbane, getting to the island is far simpler than I had imagined. There are several ferries to and from the island each day. It’s advised to book ahead. 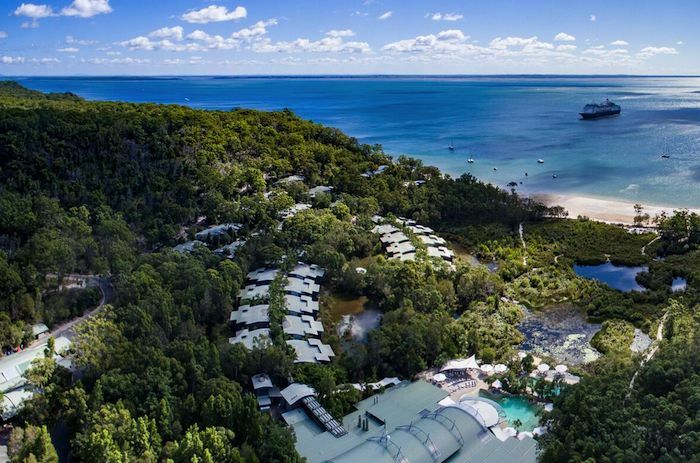 We left our car at the Kingfisher Bay Resort’s mainland parking facility, and caught the short 50 minute ferry ride from River Heads (near Hervey Bay) directly to the resort. We were getting the early morning ferry so stayed at Hervey Bay the night before at the wonderfully appointed Best Western Plus Quarterdeck villas, perfectly positioned between Hervey Bay and River Heads. It meant that we didn’t have to rush the next day. 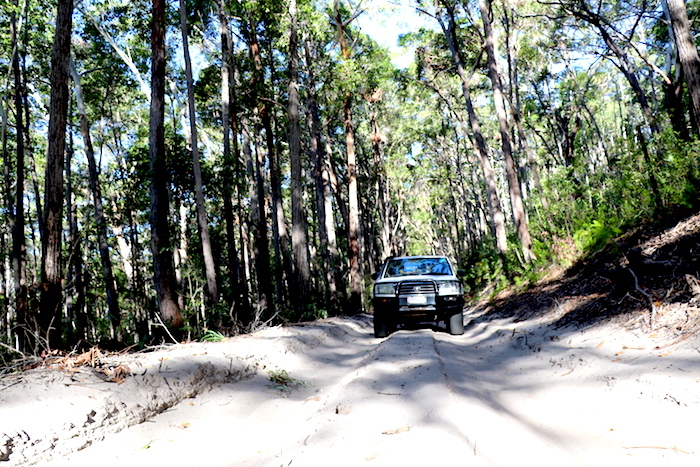 Hiring a 4×4 is not cheap on Fraser Island, but even if you hire one for a day as we did, it will really make this trip an adventure that you won’t forget in a hurry. 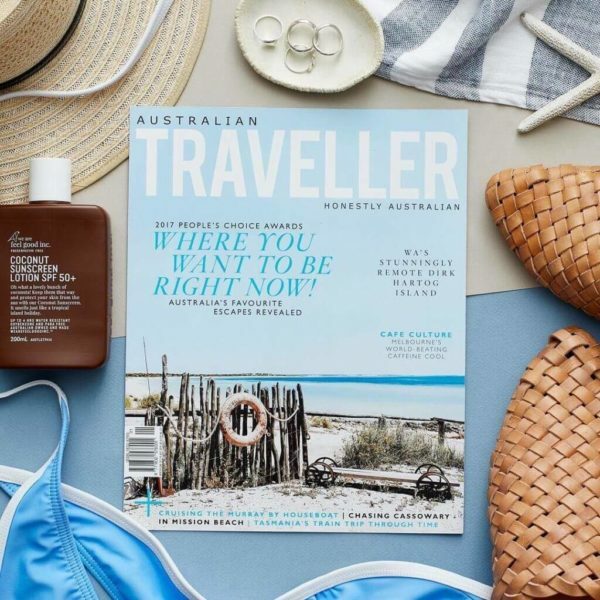 WIN a trip to Fraser Island. Competition coming soon. 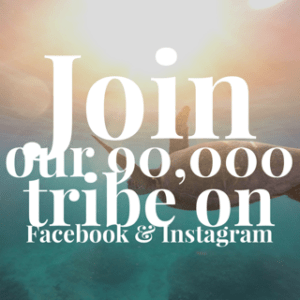 Sign up to get notified first!